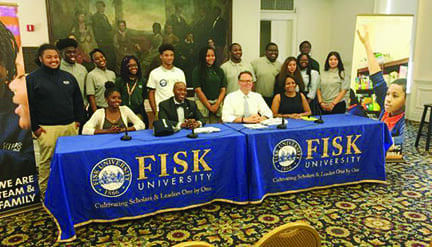 Fisk University hosts panel about the importance of higher education. Fisk President Dr. Kevin Rome (second from left) expresses his enthusiasm for this partnership. NASHVILLE, TN — The Knowledge Is Power Program (KIPP) is a network of free college-prep schools in underdeveloped communities in the United States. It is the largest network of charter schools in America. The mission at KIPP is to create a nationwide network of public schools that are successful at serving students in underdeveloped communities while enhancing their knowledge, social character, and skills needed to succeed in college and beyond. One of KIPP’s best attributes is that it is a nonprofit foundation. With 209 schools across the country they are servicing children in early childhood, elementary, middle and high school. Their goal is for all children to excel at the college level, if presented the opportunity to. Fisk University has committed to awarding three to five scholarships a year to KIPP Nashville student. The partnership was formed so that Fisk can offer guidance to KIPP students in planning and directing their financial aid, and networking while giving them early exposure to university life. This partnership is a manifestation of opportunities for students from underserved communities to accomplish their educational goals but also reach great lengths of success beyond. Fisk University is fully equipped with programs that are ready to help students in their transition to college. With the Office of Academic Excellence and Student Performance (AESP) students are provided with initiatives and programs that are guaranteed to increase retention and high graduation rates. Also, AESP provides advisors to students who enter college as undeclared, or students facing academic obstacles or those students in need of tutoring and supplemental instruction.